WOOD JERK BLOCK SET - Rae Crowther Co.Rae Crowther Co. The Wooden Jerk Blocks feature a stackable interlocking design based on your workout needs. These blocks are handmade, glued and screwed with rounded and sanded edges as well as reinforced top layers and double braced support construction for heavy drops. 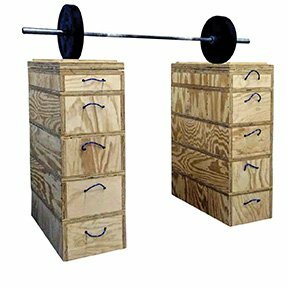 The blocks set includes the following pieces: 4 x 12” Blocks, 2-6” layers, and 2-2.25” toppers to allow you to customize your workout and adjust on the fly.